This story has been reprinted from the Dunmow Flitch Trial website. The Flitch Way was named for the famous Flitch Trials which take place every 4 years in Dunmow when married couples compete for a flitch or whole side of bacon. A common claim of the origin of the Dunmow Flitch dates back to 1104 and the Augustinian Priory of Little Dunmow, founded by Lady Juga Baynard. Lord of the Manor Reginald Fitzwalter and his wife dressed themselves as humble folk and begged blessing of the Prior a year and a day after marriage. The Prior, impressed by their devotion bestowed upon them a Flitch of Bacon. Upon revealing his true identity, Fitzwalter gave his land to the Priory on the condition a Flitch should be awarded to any couple who could claim they were similarly devoted. By the 14th century, the Dunmow Flitch Trials had achieved far-reaching notoriety. The author William Langland, who lived on the Welsh borders, mentions it in his 1362 book 'The Vision of Piers Plowman' in a manner that implies general knowledge of the custom among his readers. Chaucer, writing less than half a century later, alludes to the Dunmow Flitch Trials in "The Wife of Bath's Tale" and again does not see the need to explain them to his readers. However, is it not until 1445 that the winners of the Flitch were officially recorded. The earliest record we have of a successful claimant to the Dunmow Flitch is Richard Wright who travelled from Norwich to try his marital harmony and take home the bacon. The win is recorded in documents from the Priory of Little Dunmow still held by the British Museum. After the monasteries were swept aside by King Henry VIII, the awarding of the Flitch was taken over by the Lord of the Manor. In 1701, the local paper records our Judge's professional predecessor Thomas Bridge and others taking part in the Trials and spending the evening dancing and playing cards in the Saracen's Head. In 1751, the Shakeshafts of Weathersfield were successful in claiming the Flitch, recorded in the well-known print by William Ogborne. It was in 1832 that Josiah Vine, a retired cheesemonger from Reading, and his wife tried to claim the Flitch. The Steward of Little Dunmow, George Wade, another professional predecessor of our Judge, refused their request to hold a trial and is reported as saying that he regarded the Trials as being 'an idle custom bringing people of indifferent character into the neighbourhood'. It was at this stage that the Trials were transferred from Little Dunmow to Great Dunmow. Over the following years, the custom lapsed. The pointed stones upon which the couples knelt were carried away and the carved oak carrying chair is preserved in Little Dunmow Priory. Victorian novelist Harrison Ainsworth is credited with reviving the Trials as an entirely civic event, separate from Church and Lords of the Manor. In 1855, following the publication of his popular novel 'The Custom of Dunmow', in which Ainsworth recounts the attempts by Little Dunmow's Flitch of Bacon publican to win the Flitch by marrying a succession of wives in an attempt to find the perfect one, the Trials were once again staged in Great Dunmow. Since then, the trials have been held regularly and since the end of WWII, every 4 years in a leap year. Not because of historic precedent, but because such intervals suit the situation nicely and give the organisers time to recover and build up strength to organize the next event! The modern Trials take the form of a court presided over by a Judge, with Counsel representing the claimants and Opposing Counsel representing the donors of the Flitch of Bacon, together with a Jury of 6 maidens and 6 bachelors, a Clerk of the Court to record the proceedings and an Usher to maintain order. The court is held in a marquee erected on Talberds Ley especially for the occasion and couples (claimants) married for at least a year and a day come from far and wide to try and claim the Flitch. It is not a competition between the couples. All the couples could be successful in their claim, which is vigorously defended by Counsel employed on behalf of the donors of the bacon, whose job is to test their evidence and to try and persuade the jury not to grant them the Flitch. 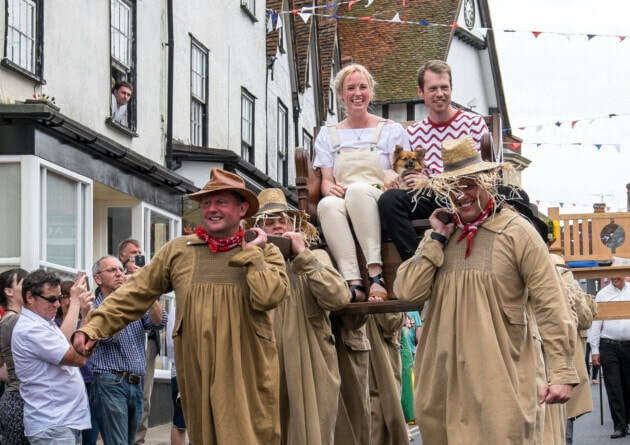 Successful couples are then carried shoulder-high by bearers (humble folk) in the ancient Flitch Chair to the Market Place, where they take the oath (similar to pre-Reformation marriage vows) kneeling on pointed stones. Unsuccessful couples have to walk behind the empty chair to the Market Place, consoled with a prize of gammon. The original custom of awarding a Flitch to those who can prove marital harmony is not unique to Dunmow. There are references from across Europe of similar customs now long abandoned. However, the town is unique in continuing to reward marital harmony with a Flitch of Bacon well into the 21st century. With each Trial comes amusement, entertainment, renewed community spirit and another piece of history in a beautiful and prosperous town. Long may it continue! The next Flitch Trial will take place on Saturday 11 July 2020.